Firstly, its cross section is 15cm by 15cm as opposed to CROSSwire’s 10cm by 10cm profile. The larger size is even faster to build thanks to improved hand access. Secondly, EXPOwire makes increased use of composite materials on top of the same aluminium core. The result is an exceptionally lightweight solution with impressive span/load capabilities! Most trussing or gantry systems are made from steel or large bore aluminium tubing. They are very heavy and difficult to set-up / dismantle. What’s more, traditional trussing systems do not fully integrate with signage, electronic displays or lighting concepts. EXPOwire is totally different. Made from 100% composite material, it was designed to be light yet extremely strong. Available at an extremely affordable price point, EXPOwire is aimed at the small to medium sized exhibition stand sector. 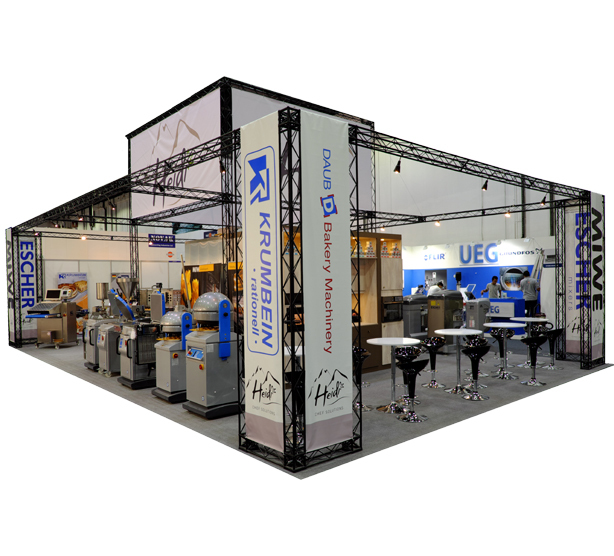 As with other X-Module modular solutions, graphic panels, lighting etc, simply attach to the framework to create a highly professional looking stand. Through the use of composite materials, EXPOwire is strong yet extremely easy to transport. With a range of innovative connectors, EXPOwire is easy and fast to build without the need for tools. Unlike other trussing, EXPOwire’s composite materials are impervious to scratching and stay looking fresh. Fully weatherproof all X-Module products can be used outdoors without degradation. Bring your X-15 stand to life and create eye-catching, dynamic visuals with the X-PO Light backlit display!